Criminals see businesses, such as pubs, restaurants, jewelers, service stations, and convenience stores as easy targets for quick bucks. Unfortunately, this type of crime can actually cripple a business and tag it as an easy target for future attacks. A new security development has a cutting edge liquid technology that is helping to significantly reduce theft and armed robberies for targeted businesses. It’s called DNA Guardian. It helps to establish a forensic link between suspects and specific crime scenes. The primary benefits of DNA Guardian is a deterrent against planned or opportunistic attacks, non evasive in the installation process, and provides law enforcement with additional evidence to identify the suspect(s). Here’s how it works. It’s installed above a business at the entry/exit point. The system operates by marking suspects with a clear, non-toxic, water based solution containing a unique chemical code, similar to DNA, which lasts on the skin (even after showering) and clothing for weeks. When the crime occurs, staff can activate the solution by pushing an under the counter panic button or a remote device. The mist is colorless, odorless, and can spray several suspects without their knowledge. The unique chemical code lights up under a black light. It’s clearly a deterrent for criminals. According to ADT Security Australia Managing Director, Mark Norton, “By increasing the risk of capture and conviction, DNA Guardian intensifies a criminal’s fear of being caught to the point where they abandon their plans altogether or go in search of a softer target”. It is now available in Australia through ADT Security. This high-tech crime-fighting tool used overseas has actually reduced theft by 84% with a 100% conviction rate. It doesn’t get much better than that! Don’t be surprised if you see a warning sign of “DNA Spray” at a local business in the U.S. sometime soon. This entry was posted in crime, Forensic and tagged author jennifer chase, criminologist, dna guardian, dna spray, forensics. Bookmark the permalink. 1 Response to Criminals Beware! 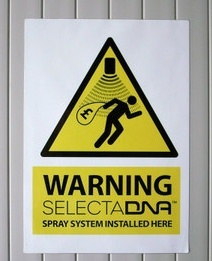 There’s a New DNA Spray in Town and it Wants to Tag You! Very informative. And it sounds effective without being invasive.